Tottenham’s late push for an unlikely title is all but over and indeed if Chelsea win at West Brom on Friday night, the Blues will be crowned champions. 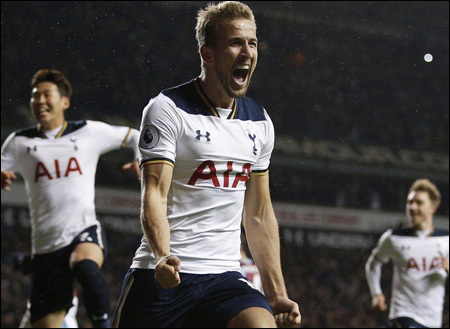 However, Manchester United will be looking to avoid successive defeats in North London in the last match at White Hart Lane before Spurs move to Wembley, we take you through our match preview and betting tips for the fixture. Spurs won this fixture 3-0 last season, but that was Manchester United’s first defeat at White Hart Lane since 2001, and this is a fixture the Red Devils are traditionally strong in. The last nine meetings have seen three wins for United, three for Spurs and three draws – Jose Mourinho’s men won the clash at Old Trafford thanks to Henrikh Mkhitaryan’s first half strike. Prior to that nine-game spell, United were unbeaten in an incredible 26 of these fixtures in a row, winning 20 of those clashes. Mauricio Pochettino’s side had won nine league games in a row prior to their surprise loss at West Ham – only their second defeat since their Old Trafford loss in November. With 50 points from 18 home matches, White Hart Lane is the most formidable away venue in the league. Manchester United suffered their first league defeat in 26 outings last Sunday at Arsenal, bringing to an end the longest unbeaten league streak in Europe’s major leagues and a club record. Mourinho’s United have played five matches away to rival clubs in the top six, and his side have yet to win one or even score a goal. Danny Rose (knee ligament) is a major doubt for the hosts, while Harry Winks (ankle) and Erik Lamela (hip) are both definitely out. United are in the midst of an injury crisis. Zlatan Ibrahimovic, Marcos Rojo (both knee), Luke Shaw (foot), Timothy Fosu-Mensah (shoulder) and Ashley Young (hamstring) are all definitely out, while several more stars are likely to be rested as this fixture comes only three days after their crucial Europa League semi final with Celta Vigo. Manchester United’s meek surrender at Arsenal last Sunday showed Mourinho’s contempt for their remaining league fixtures, which seem to be viewed as interrupting their Europa League schedule. Tottenham have won 16 home league matches to date this campaign – more than any other club – and are the only unbeaten side at home in the division. Furthermore, Mourinho’s United have played with extreme caution in each of their five matches (one in the FA Cup) away to top six rivals this campaign, and have failed to score a goal, never mind win. This is a record which the Portuguese boss must address urgently this summer ahead of the new campaign, but it will be welcome news for Spurs who will look to see off their historic ground with a flourish. Having played Celta Vigo in their most important match of the season to date, and with a fatigued and stretched squad, odds of a home win should be significantly lower than 8/11 – they are heavy favourites for this clash. Odds of 19/10 for a home win to nil are more than generous, indeed this is the likely outcome of this matchup.